In recent days, the UK economic news has been full of woe as companies decide to cut their losses in the UK, as the government seems determined to go ahead with its game of EU no-deal chicken. To some it might not be such a surprise that such uncertainty has prompted business movement, but most expected this kind of exodus to happen earlier. Companies regularly plan budgets, spending and so on months, or years ahead - but we still face dizzying uncertainty about trading conditions with just 40 or so days to 29th March. Those keeping an eye on the business news will have noticed recent decisions by the likes of carmakers like Nissan, JLR and Ford. But UK's service industry is arguably more important to the country, with the likes of Barclays and Bank of America spending £500 million preparing for Brexit. In Similar financial services news, Barclays is moving vast sums to Ireland (€190bn / £166bn), and UBS is reducing its UK holdings by moving €32bn / $36.5bn of assets to Germany. So far tech companies haven't featured so much in the Brexit flavoured headlines. In November, the UK Tech sector seemed split over May's Brexit deal. But today I noticed something quite sad to a UK tech enthusiast - the Chairman of the Raspberry Pi Foundation is getting ready to move production for some of hus businesses out of the UK. In a Tweet, the Chairman of the Raspberry Pi Foundation and Raspberry Pi (Trading) Ltd, Dr David Cleevely CBE FREng, FIET, informed his followers of his decision. 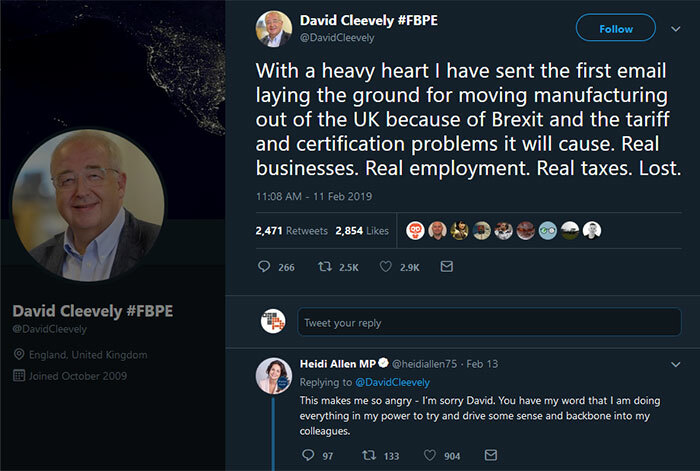 "With a heavy heart I have sent the first email laying the ground for moving manufacturing out of the UK because of Brexit and the tariff and certification problems it will cause," wrote Cleevely. "Real businesses. Real employment. Real taxes. Lost," he emphasised. Among the comments of support and sadness, someone asked for clarification of how many jobs were at stake. Cleevely admitted that the production staff roster was quite small. But he added "It breaks my heart. Repeated across the UK it means we are in for a long tough time. I spent my life building businesses and contributing to this country, often for no remuneration. I have never felt so bleak about our prospects." The RasPi chairman later indicated that Ireland and the Netherlands are likely beneficiaries of the business, with good English language skills and legal systems. 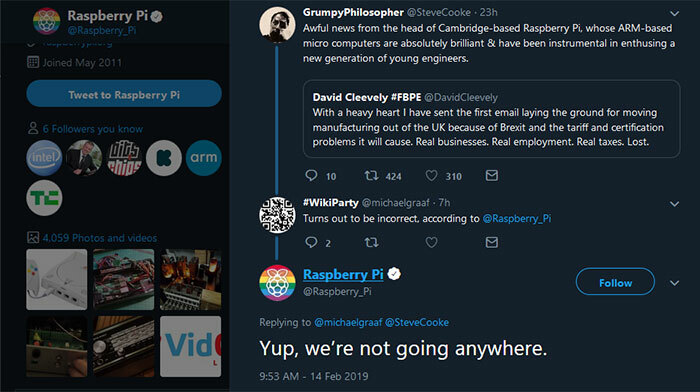 UPDATE: The official Raspberry Pi Organisation Twitter account has stated that Cleevely was talking about some of his other tech business(es), not about the manufacturing of the Raspberry Pi in Wales. It followed up with the statement that "we’re not going anywhere". Interestingly back in mid-2017, Raspberry Pi inventor Eben Upton was very positive about the initial impact of Brexit - the pound had lost quite a lot of value very rapidly, making the tiny computer a better export prospect. Upton added that "It isn't a great idea to devalue your way to success [but] it did make a substantial contribution to our profitability last year. It's rocket fuel, it really is." I love how people with no idea what will happen, post things like this. how does he know what the future holds. I think it is too early to “know” what actual taxes and whatever else will be after Brexit. Probably in the end, there will be not so much different, but you will have your proper independence. That kind a doesn't have a price. While not great news, at least for the Raspberry Pi production is remaining in the UK as confirmed by the foundations' official Twitter account. The quoted tweet from David Cleevely refers to a different venture.